PLAY (August 2017) was a performance that brings together live theatre and gaming culture to create an immersive experience for children aged 5-11 and their families. Participants met Sator, a character who had fallen into our world from her homeland, and they had to go on a quest to unlock the Sentinels and enable her to rejoin her family. Along the way they had to solve both real-world and digital puzzles. PLAY took place in a disused shop unit in Stoke-on-Trent city centre. The show followed a Research and Development project with the Games Design course at Staffordshire University. 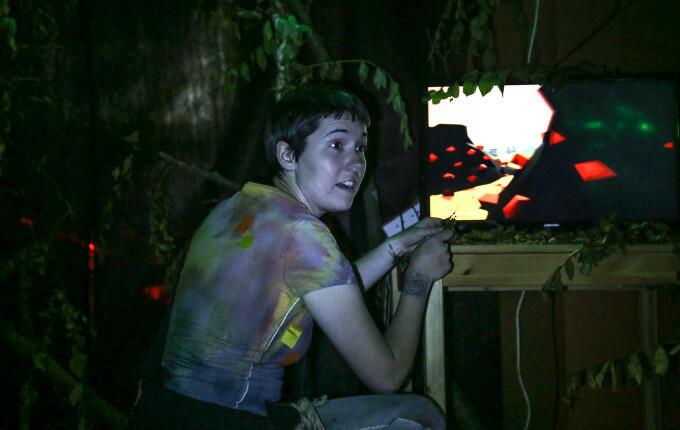 Recent games graduates created the virtual world that audience members and cast moved in and out of during the show. PLAY was directed by Saul Hewish and designed by Noah Rose.